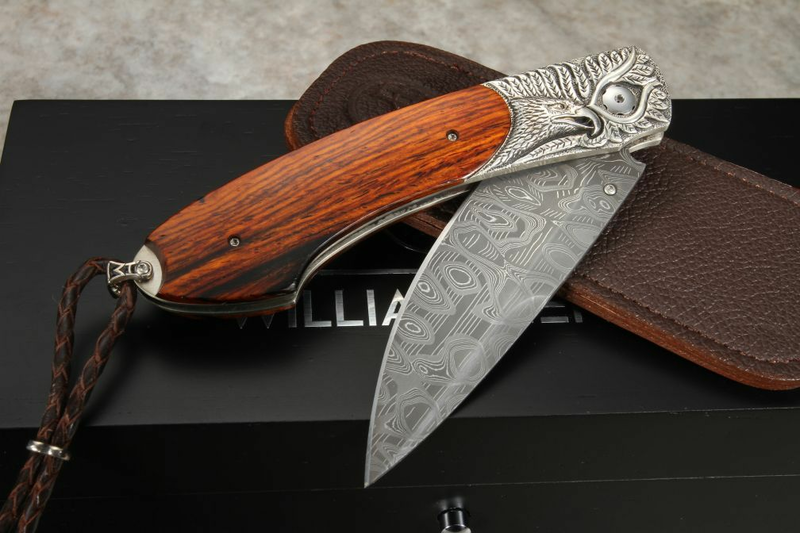 The B12 Majestic is a new limited edition design from William Henry Knives, it features a stunning copper wave pattern stainless damascus and carved sterling silver bolsters in an eagle motif. 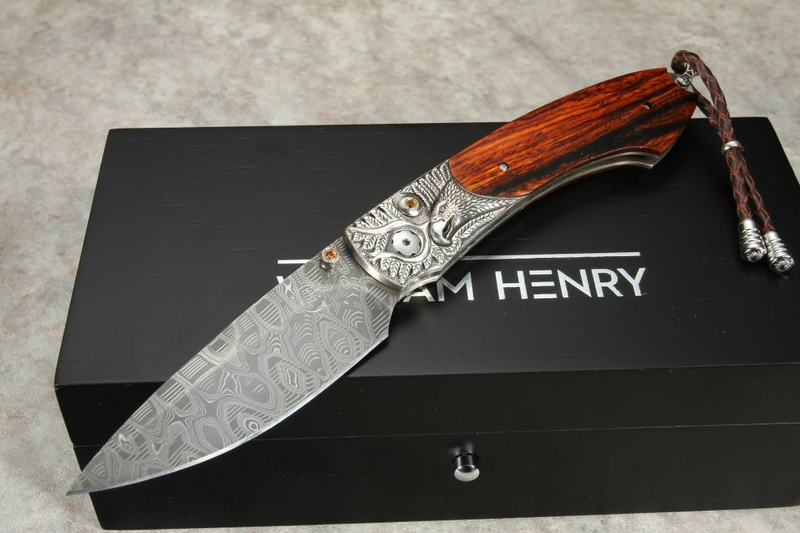 If you appreciate the artistry of William Henry you will love this upscale folder. The blade on the Majestic folding knife is hand-forged 'Nornets Nest' pattern damascus steel made by blacksmith Mike Norris. The long drop point blade shape provides the user with a nice cutting radius and a hollow ground blade. The 3" damascus steel blade opens smoothly and one-handed accuracy via the thumb lug mounted on the blade. This William Henry B12 handle has citrine gems inlays on the thumb stud and button release. A the end of the knife, it has a braided brown leather lanyard bale with stainless steel beads that provide an added touch of elegance. The cocobolo handles are a dark reddish color. Light and easy to carry, this high-end folder comes with a brown leather clip case. 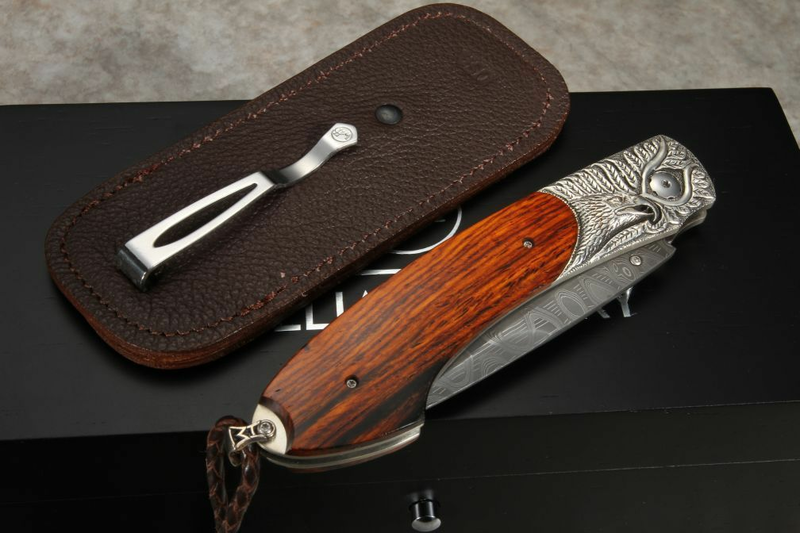 This individually numbered knife comes with a certificate of authenticity and an upscale wood presentation box. 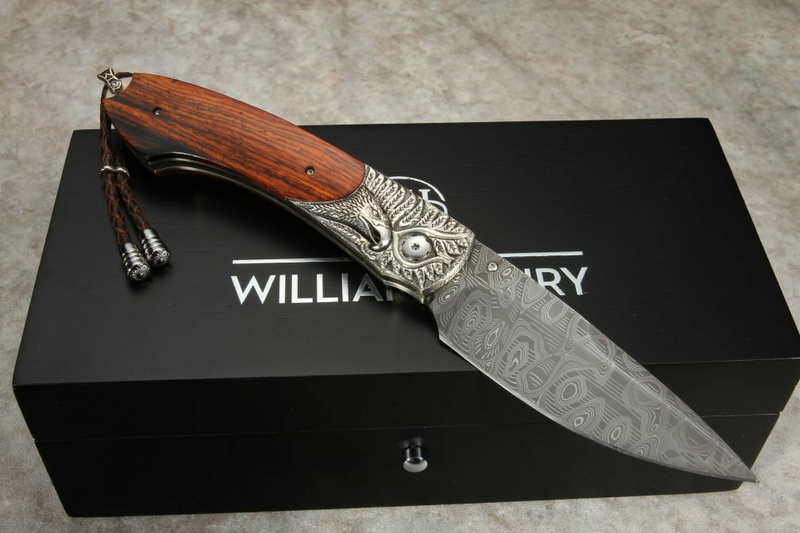 This is a William Henry Studio limited edition of 100 numbered knives. Order with confidence, we are an authorized WH dealer with a full satisfaction guarantee. We will ship it to you for evaluation free of charge in the US.